Indeed, she was only the second runner I had seen in the last eight miles. The other was another woman who passed me like I was standing still. 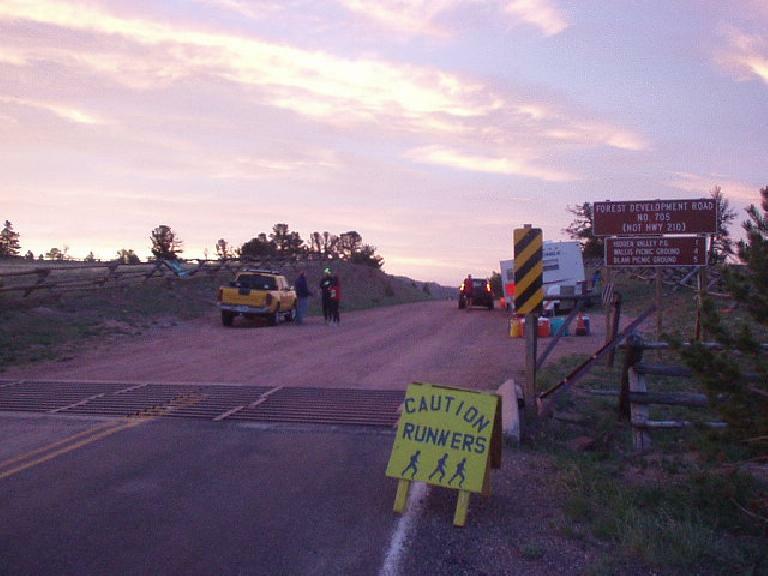 The Rocky Mountain Double Marathon—a 52.4 mile run—wasn’t like this for entire duration of the race. At the 6:00 am start of the race there were at least 80 other people doing the “mere” 26.2-mile option, and at least 17 other runners attempting the double. In fact, during Miles 20-26, I was far from alone. Alas, while the first 13.1 miles went well for me (1:57 despite hills) and even the second 13.1 miles were not too bad (2:22 despite strategically walking up some ascents), my pace predictably turned for the worse in the last 26.2 miles of the race. Of course, this soon changed when a long (~1.5 miles) uphill appeared, and I transitioned into walking mode. It would be hours before I could run for more than 10 minutes at a time. As my quadriceps started to tighten it became harder and harder to pick up my feet. Surprisingly, otherwise the rest of my body felt fine—no blisters, ligament or knee pain, ankle sprains, etc. It was just those damn quads that disallowed me from bending my legs without some major muscle discomfort. As the terrain continued to roll and there were no other runners in sight for miles, my spirits became further demoralized. My quads continued to deteriorate. At Mile 42 I began even walking on the downhills. A support guy on a BMW GS motorcycle saw my pathetic state and offered me help numerous times. The first thing he did was offer me a whole bottle of Gatorade, which I accepted. The third thing he did was get me back on course when he noticed I overshot a turn by 1/8th of a mile. (“Thanks so much,” I exclaimed after that. “Man, that would have been disastrous!”) It was the second thing he did, however, that really saved me. He gave me two Advil when I asked for them. Now, mind you, I have not taken any painkillers (or any drug for that matter) in about three years. First of all, I never thought painkillers really did anything for me. I’d take them and feel no different. “It’s primarily the placebo affect,” I’d think, trying to rationalize why they worked for others. Secondly, I am just adverse to drugs. Especially Advil… I seem to recall advice to “try not take ibuprofen during a marathon.” (Apparently, ibuprofen can accelerate the onset of hyponatremia.) So this underscores how desperate I was. I was walking, with spurts of running (and then complete frustration) for ten seconds at a time, and it was just getting more and more difficult to pick up my legs, even for baby steps. Anyhow, within 20 minutes, the Advil performed a miracle. I had just gotten to a downhill section when I noticed there was no more pain in my quads at all! 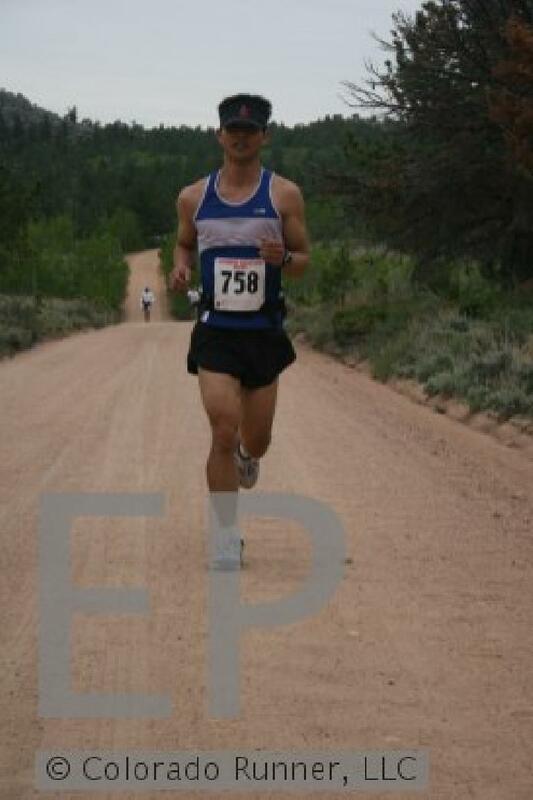 It was like I was running at Mile 17 even though this was Mile 47. From that moment on I did not walk again. The weather may have played a role in that. For most of the day, the temperatures were near-perfect for running—maybe just a tad cool at times for just the singlet I had on, but not bad. However, as the day progressed, the horizon was becoming darker and darker as grey, gloomy storm clouds loomed above. With three miles to go it was still relatively dry though. I even thought, “it can go ahead and rain as much as I care. I’m so close to the finish!” Of course you know what happened next, maybe a mile later. Freezing rain started beating down in clumps, only to melt on my body. With two miles to go I started running with my head bent towards the ground as the frozen rain started to go somewhat horizontally at me. The winds had definitely picked up. The terrain started to go uphill again but I did not relent. “I am running all the way to the finish,” I resolved. In addition to wanting to get out of the rain, my watch provided yet more motivation to keep up the pace. It looked like it was possible—if barely—to finish under 11 hours. In my mind, anything under 11 hours seemed respectable for this distance. With one mile to go I had caught up to—you guessed it—another woman (“where are all the men?” one of them had asked me earlier in the race), who just so happened to be the first runner I had seen in the last ten miles. She was walking, so I whizzed by while muttering a “good job” to her. More exciting was the last quarter mile. This was about the steepest part of the race. I knew it was runnable from the first time up it with the curly haired girl, so I kept at it. I could see two people up there well ahead of me, and it seemed like I had little chance of catching them. Too late. I bolted by her with about 30 feet to go, and sprinted through to a 9th-place finish. What had been a weary, depressing race at times was now one of euphoria and glee. I had done it… 52.4 miles. One more goal off of my list. On a hilly course, through a thunderstorm too. What a day. I lingered around thanking the motorcycle guy for outright saving me, and then apologizing to the gal for passing her at the end. They were both cool about it all. They too were just happy to be finished. And perhaps most of all, happy not to be all alone out there. felix, you are absolutely amazing!! i can’t believe this story! Great, great job, and congratulations! That’s nuts!! Well done though.